As some may know I've been working with a friend to develop a miniature skirmish game. In this game, anything can happen. Romans v/s cybercops v/s wizards v/s aquatic dogmen... anything. 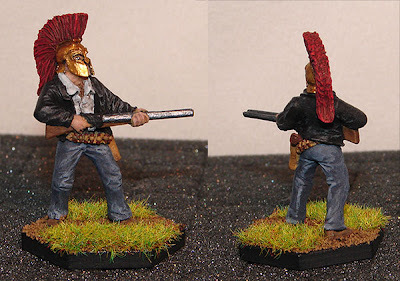 So I decided to add a little flair in my group of Cowboy miniatures by adding a converted Spartan. The body is from Black Scorpion and the head is from a Reaper helmet set.